At Home with Gracey: What's A Pizzelle Anyways? Pizzelles are a type of Italian) cookie baked on a special waffle iron. 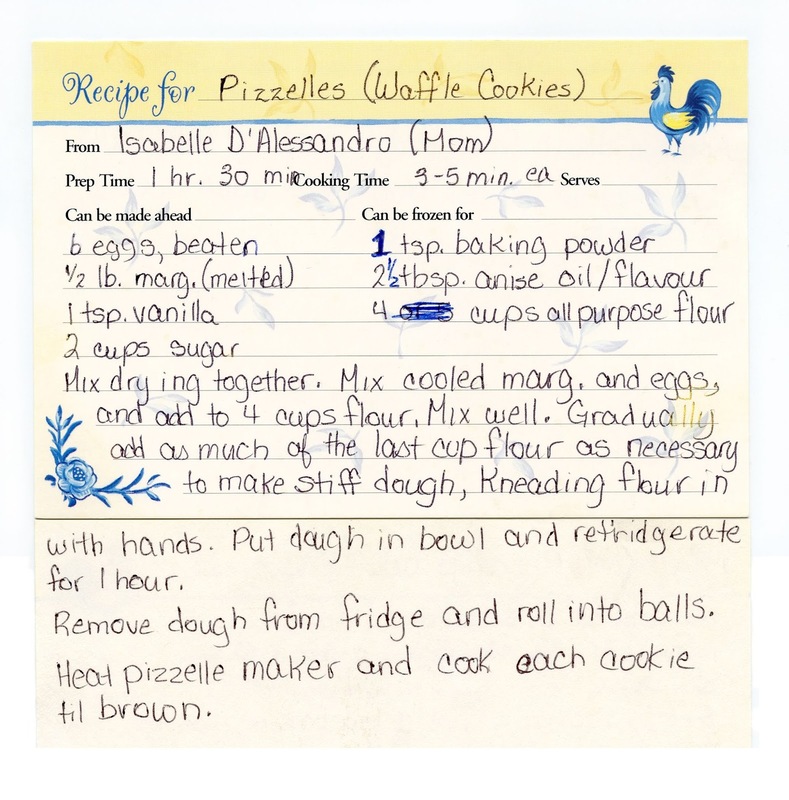 In our family, Pizzelles are traditionally made at Christmas, but many Italian families also make Pizzelles at Easter. The recipe I'm going to share came from my mom, who got it from my paternal grandmother who was born in Pisticci (Italy) and whose family came to Canada, bringing with them many of their Italian recipes and traditions. 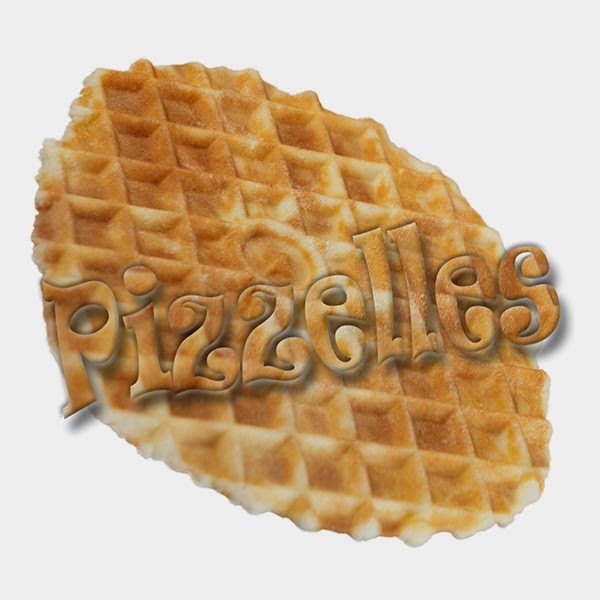 Pizzelle recipes can be found all over the internet, but of course, most of us who know and love the humble pizzelle have been eating them since long before the internet came about. 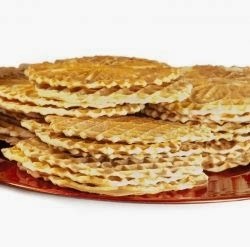 Pizzelles are traditionally made (in our family) with Anisette (a liqueur flavoured with oil of anise) which tastes a little like black licorice, but licorice is flavored with oil from the Athimathura plant – and while the taste is very similar, they aren’t the same plant family. When the true liqueur isn’t available, we use anise oil, as opposed to the extract (which doesn’t provide results quite as nice, but will work in a pinch). If you can, try to use the best quality of Anisette you can afford. My mom almost never bought this liqueur since neither she nor my dad drank it (her liqueur of choice was Creme de Menthe), but my uncle always had this amazing bar that had everything – just about any liqueur, liquor and wine you could name was there. He usually filled up Mom’s little “cooking bottle” every year with Anisette for the pizzelles. "Pizzelles are the oldest known cookie and originated in the mid-section of Italy". On to the recipe and method of preparation – at least the one my mom taught me. This is my Mom’s recipe, handed to her by my grandmother, and it’s the one I use every year. The image allows for anyone to download and print the recipe without having to copy all the ingredients, so if you want to try this recipe you can download a larger size image by clicking the image, and saving the full size to your computer. Remember that this is a recipe – it doesn’t have to be printed at 300dpi so if you want it to fit an 8.5 X 11 inch page to stick in a binder, adjust the print dpi accordingly before printing. Our family has always used margarine (don't use light or whipped margarine) for these cookies, so if you plan to substitute butter, I can’t vouch for the results. We’ve never tried them with butter before. The margarine should be melted and left to cool “just enough” – you don’t want it “cold” – it still needs to be in liquid form, and not beginning to separate into solids. When doing the final mixing, always use your hands (make sure you wash them, ok?) – partly because getting it right includes the way the dough feels. It shouldn’t be so wet that it sticks to your hands, but it also shouldn’t feel dry, like bread dough. It’s a “spongier” type of dough than regular cookie doughs, so it isn’t going to feel like a normal cookie dough, either. If you’ve never made these before, you won’t really know what feels right until you’ve made them once or twice – after that, you’ll know. Honest. 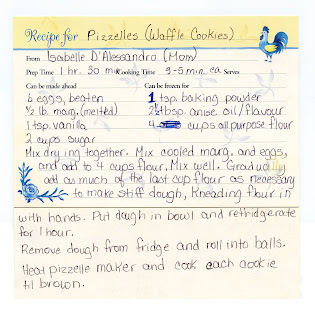 Back when I was small, cooking or “baking” the pizzelles was done over the stove with a castiron pizzelle iron – “manual mode”. This entailed turning on the stove top burner, and placing the iron on it to heat. Once ready you placed a ball of dough in the middle, squeezed the iron closed and waited for a minute or so before flipping it to the other side to complete cooking it. This browned the waffle-cookies on both sides. You then removed the iron from the stove burner, and removed the cookie from the iron before it got cold. Then you started all over with the next cookie. This old waffle iron of Mom’s made just one pizzelle at a time, so considering the fact that it took about 5 minutes for each cookie … making more than 12 dozen cookies each Christmas had to be a labour of love. My mother’s first electric pizzelle maker came from Italy (a gift from my grandmother after one of her visits “back home”) and it was heavy – completely chromed from top to bottom it was a beautiful thing to look at, but it weighed a ton. The joy of this iron for mom was that it made two pizzelles at a time, and she wasn’t stuck in a tiny galley kitchen sweating over a hot burner for hours. 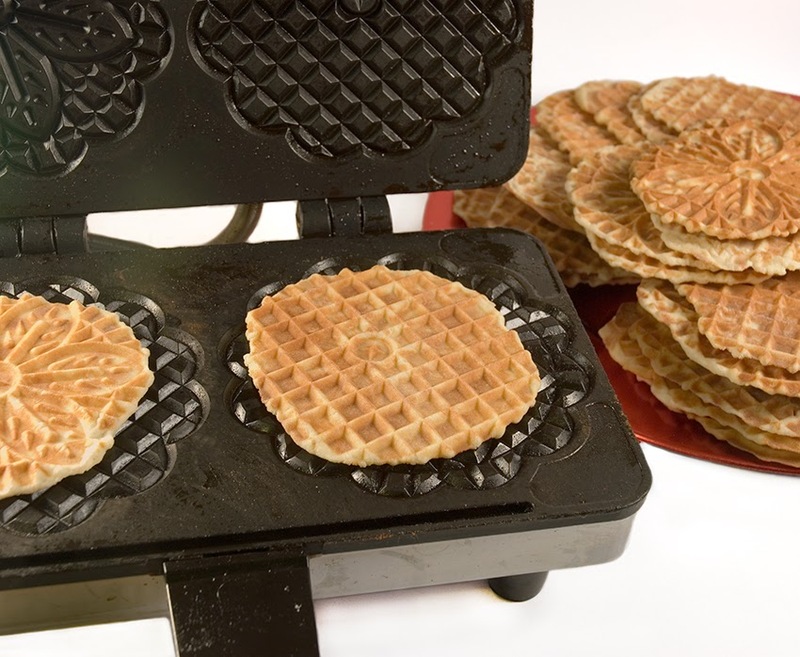 She’d set the pizzelle iron up on a large tray on the kitchen table, and sit leisurely while she baked the waffles. I used my mom’s old iron til it finally quit, and was lucky enough to find myself a brand new one at a church garage sale – still in the box and never used (for a big old price of $2!). When I asked why they were selling it when they hadn’t used it their reply was pretty simple – they didn’t really know what it was or what they could make with it. I decided since I needed a new one so badly that I wouldn’t argue with the price – I did ask if they were sure $2 was enough, and they assured me it was. You can purchase pizzelles ready made and packaged in some shops – somehow, though, they aren’t quite the same as my own. My kids refuse to have these at Christmas, but if you haven’t had pizzelles and want to try them before you consider making your own, then purchasing them ready-made (either pre-packaged from a shop, or from an Italian bakery) is probably a good option. Purchased pizzelles are often made with different flavourings: vanilla, orange, lemon and hazelnut can often be found in shops. Our family does not care much for the other flavours – I suppose part of it is simply that the anisette is the traditional flavouring we know, and that’s what we expect in a pizzelle. … and where grandmother got it from, we may never know (probably her own mother).